It’s a subject we’ve covered previously, but here at Click Consult we’re determined to ensure that we allow data to drive our opinions. So, though experience had led us to this conclusion previously, the results of our recent survey allow us to be that much more secure in our assumptions. It is a common fallacy in business that price is the major driving force in gaining and maintaining a customer base, and though each of us can no doubt recall a time we’ve turned away from a cheaper alternative, it is not a memory that is carried through into business strategies. 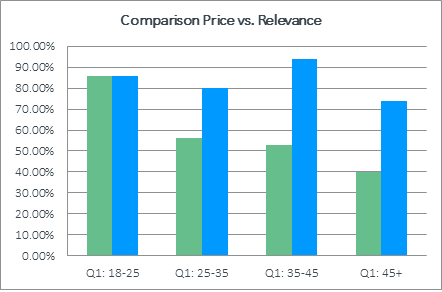 In actual fact, Click Consult’s research has shown that not only is price not as important as we often think, but that it is actually the third concern in all but the 18-25 demographic, and that it consistently drops in significance as people age, with only 40% of the 45+ respondents stating that it was either ‘very’ or ‘extremely’ important to loyalty versus 85.71% of 18-25’s. Download our ‘Why Search Marketing Is Marketing’ eBook today! So what does this mean for brands operating online? The first thing we will state is that, clearly, price will most likely play a decisive roll between two evenly matched competitors. The solution, therefore, is to ensure that your brand and its competitors are not evenly matched. This is where the personalisation result really offers hope to any business operating online. With personalisation and relevance listed as the major factor in three out of four measured demographics (and rated equally with price in the 18-25’s), a brand’s online presence can give them a real edge over their competition. As we’ve mentioned in blogs about email marketing, keyword strategies and the evolution of search marketing, as well as various eBooks including our most recent, personalisation is one area where search marketing truly excels – there is an abundance of data and of methods of data collection, not to mention demographic targeting opportunities available to search marketers that simply aren’t available for traditional marketing methods. It is also well established that brands which operate a blog receive, on average, 55% more visitors and 97% more inbound links, meaning that brands that reach out to their consumers get more traffic and more visibility which can only improve revenue. Brands which immerse themselves in consumer interests succeed against its competition. Ads should be targeted and personalised as much as is possible. Content should be created which targets brand culture over sales. All effort should be made to cater not just to primary interests, but secondary and tertiary too. Consumers can no longer be viewed as price driven creatures if a brand wants to develop loyalty. For more information on all facets of search marketing, visit our resources page, blogs or infographics. Or, to see what Click Consult can do for your brand, contact us today!